cheese quesadillas a delicious kick. One of my favorite aspects of Mexican cuisine is the antojito, creative small-dish tidbits ideal for snacking over cocktails and/or a lively conversation with friends. Mexico’s version of hors d’oeuvres incorporates the unique array of flavors that are popular south of the border: pico de gallo, salsa verde and salsa roja, queso fresco, black beans, and more. The base is usually of the tortilla or tostada variety. 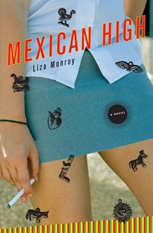 In Mexican High, the main character, Mila, who moves to Mexico City when her diplomat mother is reassigned to the Embassy there, discovers the many sides of its culture. Mila attends a high school for the elite upper echelons of Mexican high society. The atmosphere at the school ties in to the political and economic climate and the powerful people who set its tenure; kids in her school are pulled out of class to be informed that their fathers have been assassinated. Mila searches for love, friendship, and peyote, and amidst the more dramatic storylines she also discovers the country’s delectable cuisine: pollo con mole, tacos al pastor, and, of course, quesadillas. The quesadilla is an ever-popular antojito; pretty much any Mexican restaurant you can go to has them on the menu. But the garden-variety melted-cheese-on-a-tortilla seems bland compared to all the variations on the dish that one can find in Mexico. And sour cream can’t compare to crema fresca – the fresh, milkier version that tops many antojitos. This recipe, introduced to me by Florida-based chef and cooking teacher Bill Hettig, is something Mila would order at one of the late-night Mexican restaurants she frequents in the novel. I like it because the green salsa and poblano chilies give the quesadillas a spicy kick, but aren’t too much for sensitive palates. (Despite four years of living in Mexico City, my palate never quite adjusted to super-spicy foods.) And I love the distinctive taste of cilantro, which goes especially well here. Note: Wear plastic or rubber gloves while handling chiles to protect your skin from the oil in them. Avoid direct contact with your eyes and wash your hands thoroughly after handling. 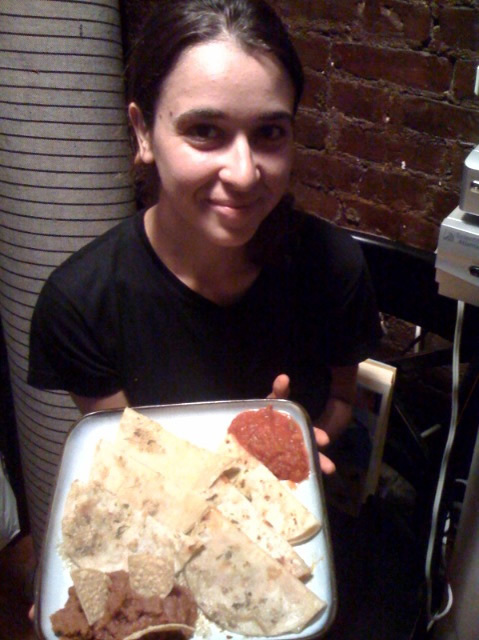 You can use a smaller amount of the pepper mixture in each quesadilla to tone down the spiciness. To prepare the filling: Heat 3 tablespoons oil in heavy large skillet over medium heat. Add poblano chiles, cover and cook until chiles are soft, adding water by tablespoonfuls if chiles become too dark, and stirring occasionally, about ten minutes. Uncover. Add garlic, and saute 1 minute. Transfer to medium bowl. Stir in cilantro, salt and pepper. To prepare the quesadillas: Place 1/4 of poblano chile mixture on one half of a whole tortilla. Top with 1/4 cup of cheese and 1 tablespoon of salsa. Fold in half. Repeat. Heat 2 teaspoons oil in heavy large skillet over medium high heat. Place two filled tortillas in pan and cook uncovered until golden brown and cheese melts, about three minutes. Transfer to cutting board. Cut each quesadilla in to 6 pieces, and transfer to platter. Repeat with remaining quesadillas.